I should have known what I was getting into when I opened this bottle. If I'd stopped to pay attention, to look at the label and see it for exactly what it is, I would not have been stupefied when the wine filled my mouth. The surprise wasn't severe, like eating a Skittles candy when you're expecting an M&M, but still, I was confused. Coteaux du Loir, named for the Loir tributary off the Loire river, is the northern most region in the Loire Valley and known mostly for the small - and dwindling - appellation of Jasnière, which produces some of the driest and most age worthy chenin blancs in the world. For reds, well, as I pulled the cork from the bottle, I was thinking cabernet franc. But when the wine was so light and pale in the glass that I could read through it (as well as I can ever read my handwriting), I assumed it was pinot noir or gamay, two of the three other common red wine grapes in the Loire, along with Malbec. When I put my nose in the glass, it had the ripe cherry aromas sometimes found in pinot noir and gamay, but it also had a distinct black pepper note that threw me off. WTF was this? Pineau d'Aunis, of course! Native to the appellation with very few plantings and rarely seen, the pineau d'aunis is a true off-the-beaten-path little berry that's not for the masses. 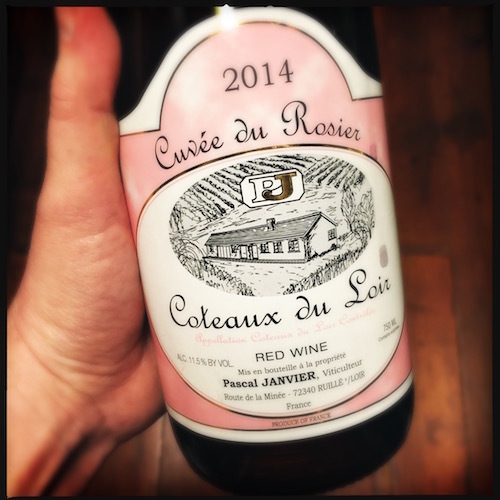 Pascal Janvier's 2014 Coteaux du Loir is the extreme antithesis to high alcohol, face slapping reds. Its pale color rivals some saturated rosés I've seen from the Rhône and Spain, though with a clear, ruby red hue. Bright cherry and clean black pepper notes on the nose with cherry flavors on the palate, bright acidity, and tannins that kiss the tongue, then flow seductively over it before finishing bone dry. I like it with a high fat, creamy cheese, but then I like just about every wine with high fat, creamy cheese.